Product prices and availability are accurate as of 2019-04-11 20:56:38 EDT and are subject to change. Any price and availability information displayed on http://www.amazon.com/ at the time of purchase will apply to the purchase of this product. Worried about being outdoors in the dark at night? Do you want to enjoy Swimming outside at night? 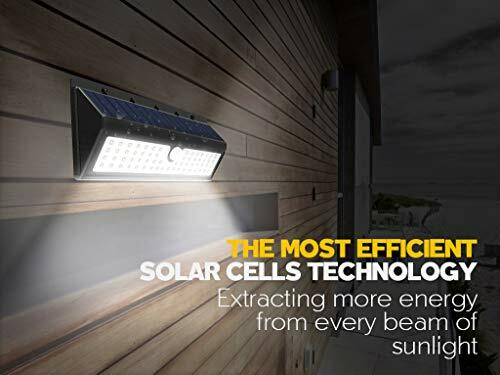 With our innovative solar-powered motion activated light you can provide your home or business with security in minutes. It can also be used to provide light to areas that have inadequate illumination such as attics, garages of porches. Get close to life, and Enjoy It! This solar panel can convert up to 17% of the sunlight it's exposed to into usable energy. This is both environmentally friendly and convenient. There is no need for any complicated wiring or installation. Ingenious? It has a built-in PIR motion sensor that will activate the light at the first sign of movement. 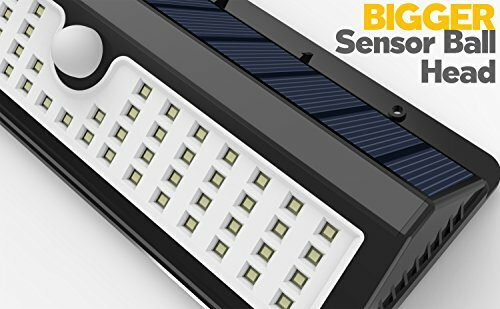 The sensor has a range of 10-26 ft.
1.Strong Long Light Mode: When it fades into night, the light will keep strong and bright until it becomes day light. 2.Dim Light Sensor Mode: When it is dark at night, the light will be dim without people coming near. If people come near, it will brighten up, and the bright light will last 15 seconds until it returns to dim light again. 3.Strong Light Sensor Mode: At night, the light will be strong and bright when people come around, and then 15 seconds later, the light fades out automatically. Multi-Year Lifespan: The light's built-in battery has a super-efficient Li-ion battery. The battery can be recharged again and again and has a multi-year lifespan. Three Modes: Strong Long Light Mode, Dim Light Sensor Mode, Strong Light Sensor mode. 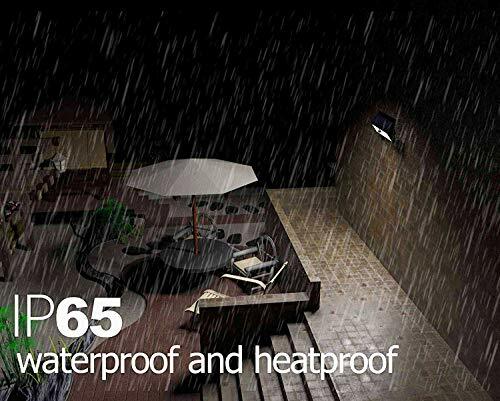 Durable, weather-resistant & heatproof plastic construction, Battery Capacity 3400mAh. Auto on at night / auto off at sunrise; Dim light when no motion / Bright light activated when sensing motion. Eco-Friendly: Our light is charged throughout the day by exposure to sunlight. 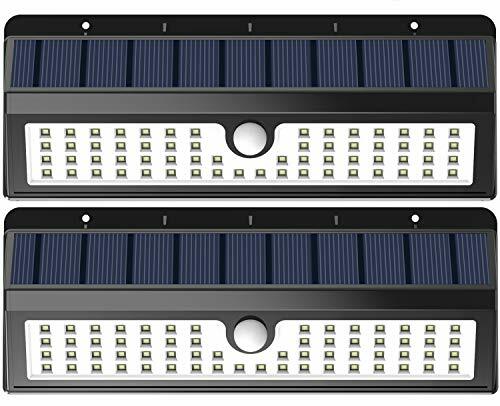 Its Li-ion Battery can provide 12 hours of illumination at night from just 7 hours of charging during the day. 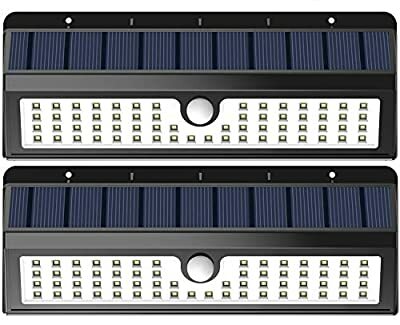 Brighter LED Lights: Our solar lights now have 62 big LED lights, which is far brighter than other solar lights on the market. 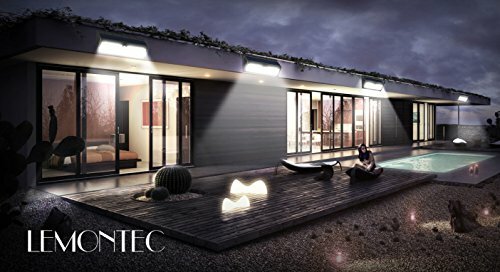 AUTOMATIC : The light features a PIR motion sensor that is activated when movement is detected within 10-26 ft. If no further movement is detected during the 10 seconds that the light is on, light will turn off.